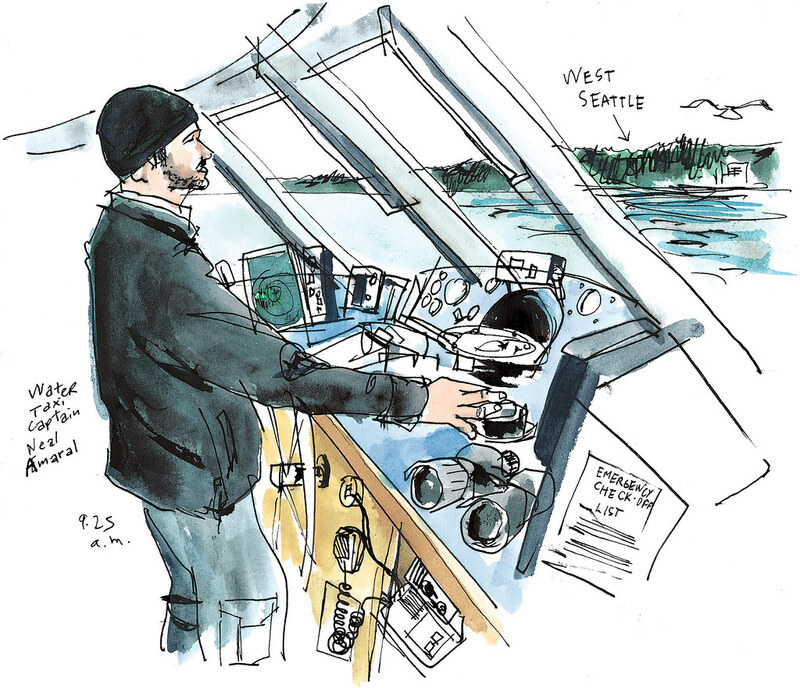 Sketched Jan. 11, 8:38 a.m.
Before I rode the West Seattle Water Taxi, I pictured a small boat that a handful of people might catch on a whim to ride across Elliott Bay. But the word taxi doesn’t do justice to this service. Water bus seems more fitting for a scheduled boat that carries up to 150 people and accepts the Orca card ($3 adults). More than 30 commuters arrived at Pier 50 as I waited to board the Rachel Marie, which returned to the water this week after repairs following a crash into the sea wall last September. That’s only a fifth of its capacity and less than the summer ridership, which averages 800 commuters daily. Many people may not be aware this is the first year of continuous service through the winter. Sketched Jan. 11, 7:57 a.m.
Sketched Jan. 11, 8:58 a.m. 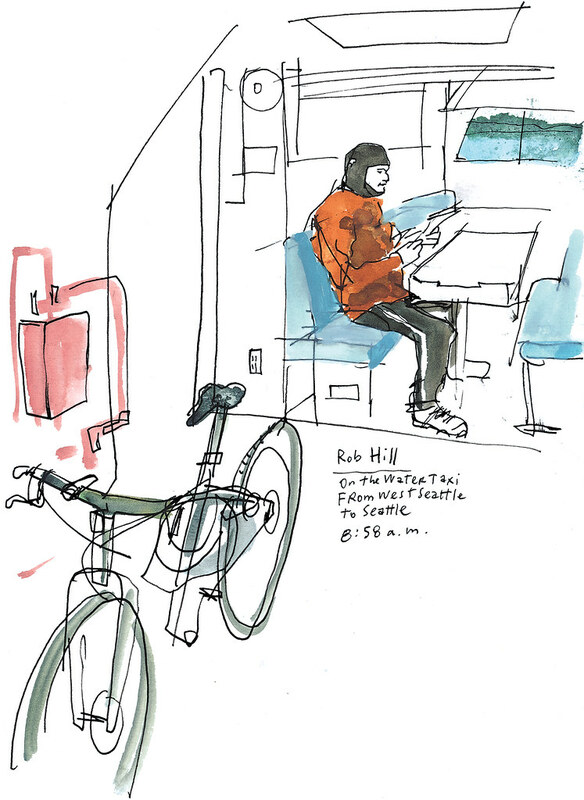 Rob Hill has taken it for more than five years and now also brings his bike on board to finish his 1-hour commute pedaling all they way to Eastlake Avenue in Lake Union. 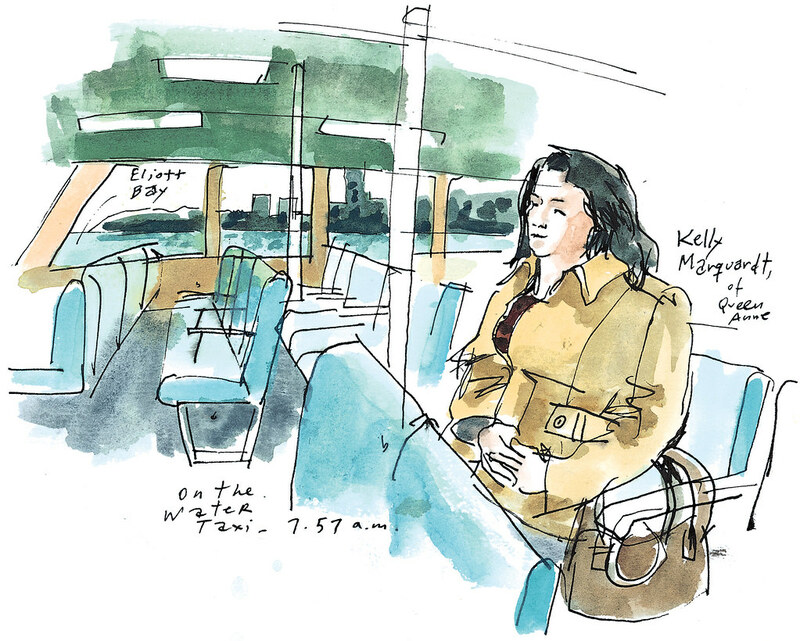 Sketched Jan. 11, 9:25 a.m.
Captain Neal Amaral said more people will opt for the 10-minute ride as the viaduct comes down and traffic gets worse. “People will start riding us,” he said.